AP EAMCET Question Paper 2019 Pdf: Jawaharlal Nehru Technological University (JNTU) Kakinada, Andhra Pradesh will conduct the state-level entrance exam i.e. AP EAMCET (Andhra Pradesh Engineering Agricultural & Medical Common Entrance Test) to offers admission in the field of Engineering, Medical & Agriculture. Candidates who have completed the AP EAMCET Syllabus thoroughly can practice the AP EAMCET Previous Year Paper to brush their knowledge and also to enhance the time management skills, speed & efficiency. 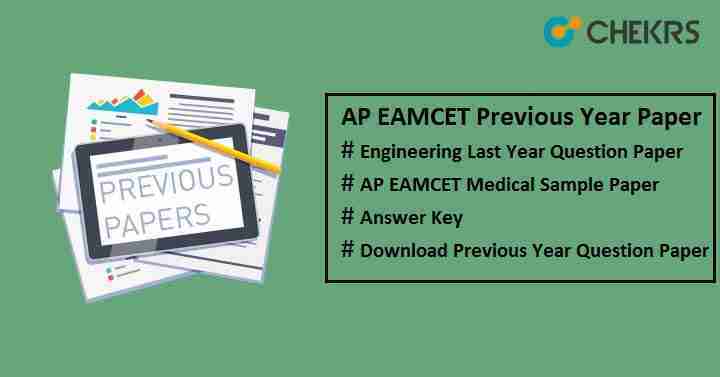 Solving AP EAMCET Previous Year Question Paper boost up our confidence level, give idea of how question paper is going to be come, what kind of question will be asked, how time should be managed to complete the paper etc. Start your preparation from today to perform well in the AP EAMCET Exam. You can also check AP EAMCET Sample Paper and must try to give online mock test on a regular basis for practice so that you can achieve scoring marks. Candidates are advised to check the AP EAMCET Syllabus thoroughly and then start their preparation accordingly. Practice Previous Year Paper and try to give online mock test on regular basis. Make a study plan and follow it strictly. Give time to each subject equally. Make short points, tricks, notes & formula and revise them regularly. Take at least 8 hours of sleep. Do yoga and meditation.